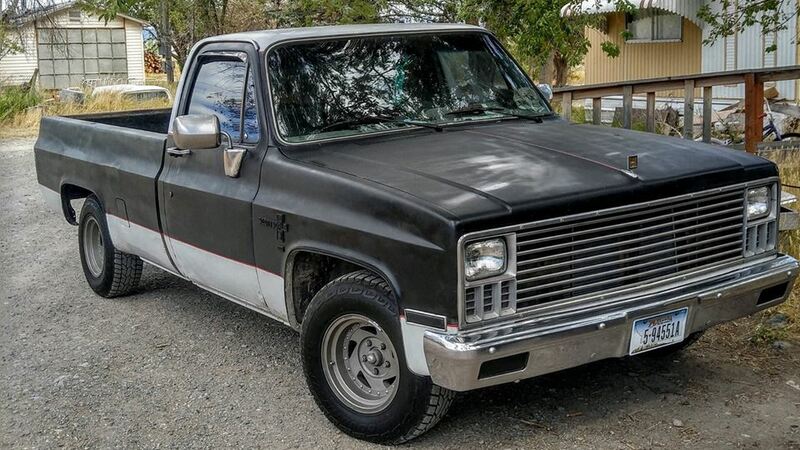 My fiance bought me this truck about 2 years ago as a rat/hot rod project for us. I've put alot in it and it is my daily driver now. It has the 1970 vette 350 lt1 (its 331 cubic inches with the current bore and stroke) It has a high duration/lift isky racing cam (292 mega) and a 68 corvette 327 large journal crankshaft. ported and decked/surfaced heads with stainless steel 2.02-1.60 valves. wiseco (-7cc flat top) .30 over pistons with hellfire rings and manley rods. Comp (high energy) 1.6 ratio rockers and pushrods, Edelbrock eps intake manifold, M/T valve covers, and a up jetted holley street demon 625 cfm carb with a weiand air scoop. And finally the Trans is a Muncie sm465 4 speed with a luk stage 3 clutch. Its just a clean and mean old chevy. Done a lot since I last posted. New air scoop, New rims, valve covers, headers which I will be putting on tomorrow with my new plug wires. It's getting there. Cleaned the motor up top to bottom today and put a new u joint in the rear. Cleaned the motor up, put new liquid proof valve cover gaskets on it, and put a new u joint in the rear driveline. New alternator and some misc. Work. Before and after collage of the motor when I got it on the top and the motor now on the bottom (6 months later) it has had a lot put into it.